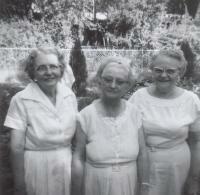 Nebraska Welborn Brown in center, with her nieces Beulah Elizabeth Ainsworth Stevens Dillon (on left) and Euhla Ainsworth Wilson. May 27, 1962. Nebraska Eleanor Roselle Welborn, daughter of Pendleton Clay Welborn and Sara Jane Allen, was born on 22 September 1884 at Jasper County, Mississippi. Nebraska Eleanor Roselle Welborn was the daughter of Pendleton Clay Welborn and Sara Jane Allen. [S1] 1900 United States Census, population schedule, Jasper County, Mississippi, Supervision District #6, Enumeration District #53, Sheet #7, Line 44.; digital image by subscription, The Generations Network (http://www.ancestry.com); from the National Archives microfilm. A printed copy is in the personal records of this researcher. [S2] 1910 United States Census, population schedule, Stringer Village, Jasper County, Mississippi, Supervisor's District 5, Enumeration District 19, stamped page 225, family 8.; digital image by subscription, The Generations Network (http://www.ancestry.com); from the National Archives microfilm. A printed copy is in the personal records of this researcher. [S3] 1920 United States Census, population schedule, Laurel Ward 2, Jones County, Mississippi, Supervisor's District 6, Enumeration District 87, sheet 12B, family 236.; digital image by subscription, The Generations Network (http://www.ancestry.com); from the National Archives microfilm. A printed copy is in the personal records of this researcher. [S120] 1930 United States Census, population schedule, Jones County, Mississippi, Beat 2, Enumeration District 34-14, Supervisor's District 9, stamped page 238, line 48.; digital image by subscription, The Generations Network (http://www.ancestry.com); from the National Archives microfilm. A printed copy is in the personal records of this researcher. [S492] Family Search.org, online, citing "United States Census, 1940," index and images, FamilySearch (https://familysearch.org/pal:/MM9.1.1/VB9B-91D : accessed 02 Feb 2014), Welborn Brown, Laurel, Beat 1, Jones, Mississippi, United States; citing enumeration district (ED) 34-5, sheet 11B, family 241, NARA digital publication of T627, roll 2035.. Hereinafter cited as Family Search.org. [S15] Inc. Jones County Genealogical & Historical Organization, Jasper County Mississippi Cemeteries 1833-1998 (Laurel, Mississippi: Jones County Genealogical & Historical Organization, Inc, 1999). Hereinafter cited as Jasper County Cemeteries.